The Large Underground Xenon (LUX) experiment, a dual-phase xenon time-projection chamber operating at the Sanford Underground Research Facility (Lead, South Dakota), was cooled and filled in February 2013. We report results of the first WIMP search dataset, taken during the period April to August 2013, presenting the analysis of 85.3 live-days of data with a fiducial volume of 118 kg. A profile-likelihood analysis technique shows our data to be consistent with the background-only hypothesis, allowing 90% confidence limits to be set on spin-independent WIMP-nucleon elastic scattering with a minimum upper limit on the cross section of 7.6×10−46 cm2 at a WIMP mass of 33 GeV/c2. We find that the LUX data are in strong disagreement with low-mass WIMP signal interpretations of the results from several recent direct detection experiments. For those of you not up with the lingo, a WIMP in this context is a Weakly Interacting Massive Particle, one of the preferred candidates for the dark matter that most cosmologists think pervades the Universe. The most important thing about the LUX results is that they pretty much exclude results from previous experiments, especially DAMA/LIBRA, that have claimed evidence for dark matter particles at low mass (i.e. 6-10 GeV WIMPS): LUX had expected 1550 dark matter events if the other detections were valid, but could not claim any events that were not consistent with background. They also set new limits on higher mass dark matter, which is 20 times better than previous limits. These new limits are from 85 days of running the experiment; further results will be reported after an additional 300 days in 2014/2015, when the results will increase the sensitivity by a factor of five or so. So the question is, if LUX is correct, what on Earth is going on at DAMA? Answers on a postcard, or through the comments box, please! Very late posting a blog today because I’ve been busy all day, preparing for and then hosting an “Awayday” in the School of Mathematical and Physical Sciences (MPS) at the University of Sussex. 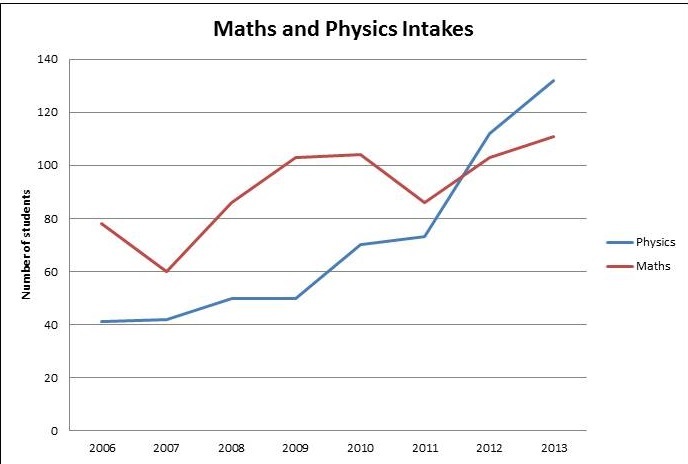 Actually, it was only half a day, and it didn’t really going that far away either, but I hope we won’t be prosecuted under the Trades Description Act..
To cope with this growth in student numbers our complement of academic staff has increased by about 50%, from around 40 just a year ago to a present number of 60. We have also increased our research income considerably over the same period. I hasten to add that none of this is my doing – it’s all down to the hard work of staff who were doing their stuff brilliantly long before I arrived. 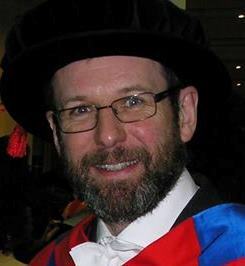 Of course it’s great to be Head of a School that is doing so well, but I am very conscious that we need to ensure we continue to provide a good experience for students during this period of growth and also to make sure that has we get bigger, all staff and students feel that they still have a voice in how the School is run. To that end we set up an event in which most members of the staff were invited – academics, administrative and technical support included – as well as our student reps. Kelly McBride, President of the Students Union, also came along. In all, over eighty people attended; there would have been more had we not scheduled it during the local schools’ half-term, which was the only available slot. The event, held in the spacious Conference Centre in Bramber House, was mainly focussed on teaching and a large part of it involved staff forming groups to discuss various themes: lectures, small group teaching, assessment, feedback, and so on. Before that there were presentations from myself (giving some background, including information about the School’s budget and how our finances work as well as how we measure up in the dreaded League Tables), from our School Administrator talking about issues relating to our admirable office staff, and our Technical Services Supervisor giving a perspective on the challenges facing our technical support staff. Each group comprised a cross-section of the School and each was given a theme to discuss. We then reconvened en masse to share the results of each discussion. I was a bit nervous beforehand as to how it would all work, especially as there has never been an event of this sort in MPS. I was more nervous before this event than I have been about anything for ages, actually. I wondered how engaged staff would feel and whether the event would turn out to be as inclusive as I’d intended, i.e. whether everyone would feel able to contribute on equal terms. In the end I think it worked out pretty well. In fact we ran over by about an hour, primarily because the discussion was so extensive. It’s not for me to say whether the day was a success or not, but although there were some things that didn’t work so well overall I was quite satisfied. In particular I was impressed with the number of good practical suggestions that came forward in the final session. We’re going to be working hard to synthesize these comments into a form we can work into our plans for the future. Most of the comments I heard from people who participated in this event after it finished were positive too. If anyone present happens to read this blog I’d be interested to hear their views through the comments. Without anticpating the feedback too much, I’m pretty sure that, with a few tweaks (mainly to focus things a bit better with fewer “themes” for discussion), this will become a regular fixture in the MPS calendar. As we get used to such events we’ll probably get even more out of them. I also hope that other Schools of the University of Sussex might find this event a useful model for similar activities they could hold themselves. I’d like to end with a public “thank you” to everyone who took part and made it so enjoyable and stimulating, to Oonagh and Steve for their input, to Catering and Conference Services for all their help (and yummy food) and above all to the inestimable Miss Lemon for the huge amount of work she put in to the preparations (especially the monopoly theme for the groups, which was inspired..). Now, however, I am completely knackered and will be going home to have a glass bottle of wine to recover. Busy day tomorrow too. Toodle-pip! 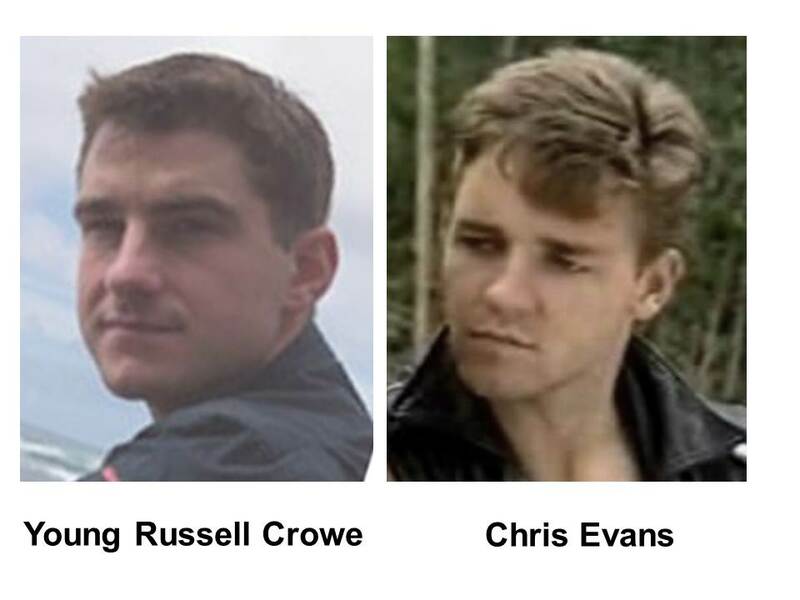 When UKATC astronomer Dr. Russell Crowe was younger, he bore a striking resemblance to hell-raising rough diamond Australian actor Chris Evans. Perhaps they share a common ancestry? 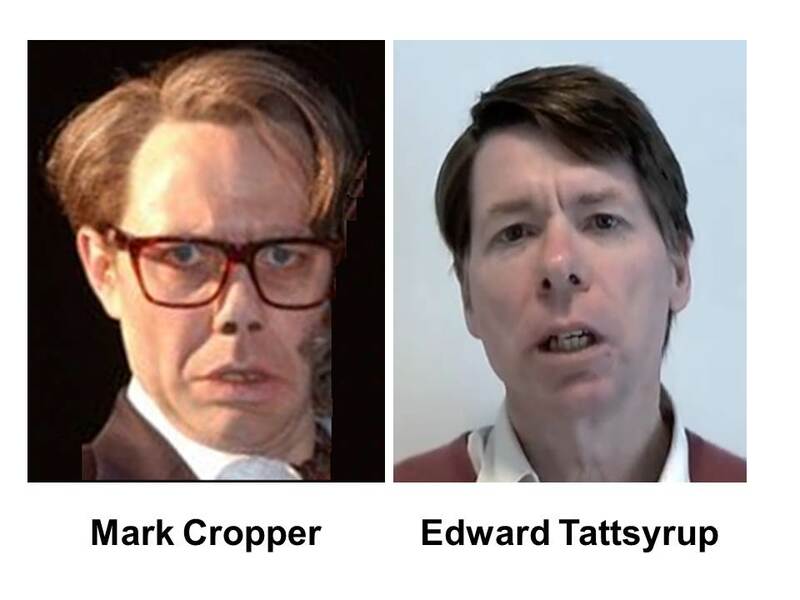 I wonder if anyone else has noticed that if Mark Cropper, sinister proprietor of the local shop in Royston Vasey, were to take off his glasses, he would look strangely like astronomer Prof. Edward Tattsyrup of the Mullard Space Science Laboratory. This is most unsettling. I wonder if, by any chance, they might be related? As expected, it was a stormy night last night, and it has been a stormy morning so far too. I was woken up a couple of times in the night by the sound of the wind and rain, but still managed to get a decent kip. When the radio alarm came on at the usual time, 6am, it was clear that I still had electricity so whatever had happened overnight couldn’t have been as bad as the storm of 1987! 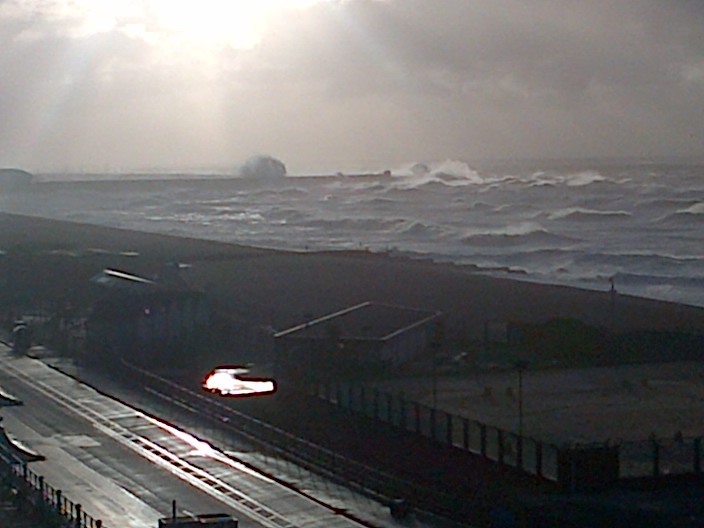 I saw a tweet before I left for work this morning advising folk to avoid Brighton seafront during the storm. That’s a bit difficult when you live on the seafront. Anyway, I did decide to take a short walk along the promenade before returning to my usual route to the bus stop. 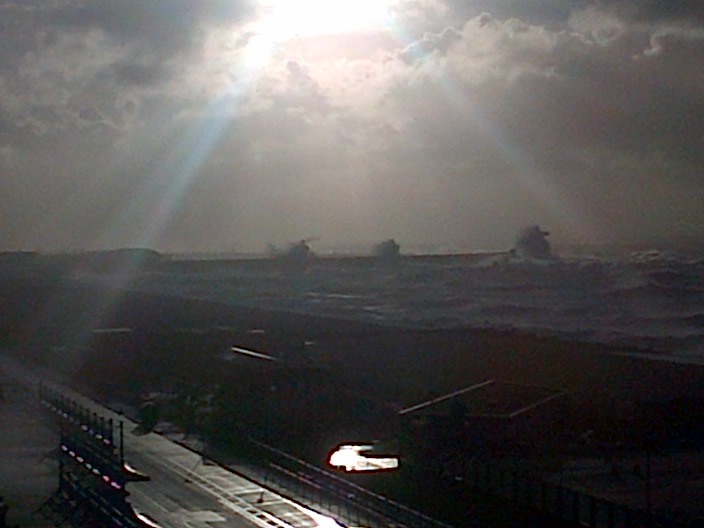 I managed to take this picture with my Blackberry, the view being eastwards towards Brighton Marina. It was quite difficult to get a picture directly into the sun, but it gives you an idea of the size of the waves crashing against the breakwater. I was pretty relieved when I got up to the Sussex University campus to find just a few small branches down. Very different from 1987! The wind is still strong, and blowing a lot of leaves about, but I think it’s going to be business as usual today. That’s a relief, because I’ve got rather a lot to do! I didn’t make it up to campus that Friday. The trains weren’t running because there was no electricity, power lines having been brought down by the storm, and even if there had been electricity the trains couldn’t have run because the tracks were blocked by fallen trees. When I did make it up to campus several days later the trees on the hills either side of the campus had been combed flat. It took years for them to recover. I hope they don’t suffer the same fate this time. 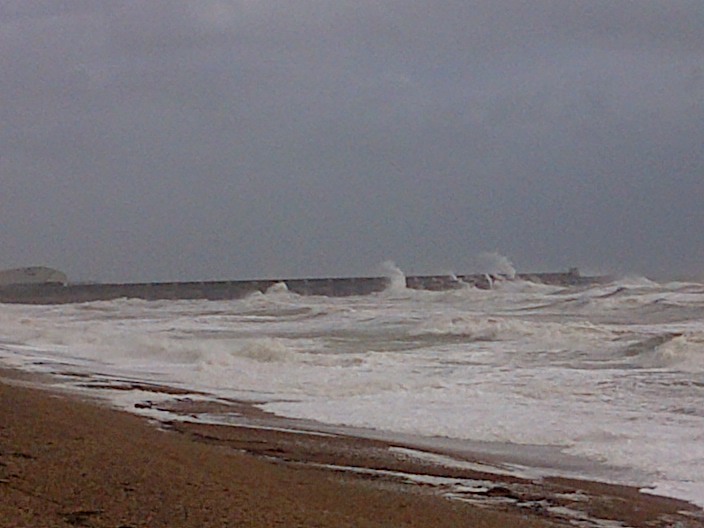 Another storm is forecast to arrive tomorrow; here is the Shipping Forecast for sea area Wight which, includes the town of Brighton and areas to the West. 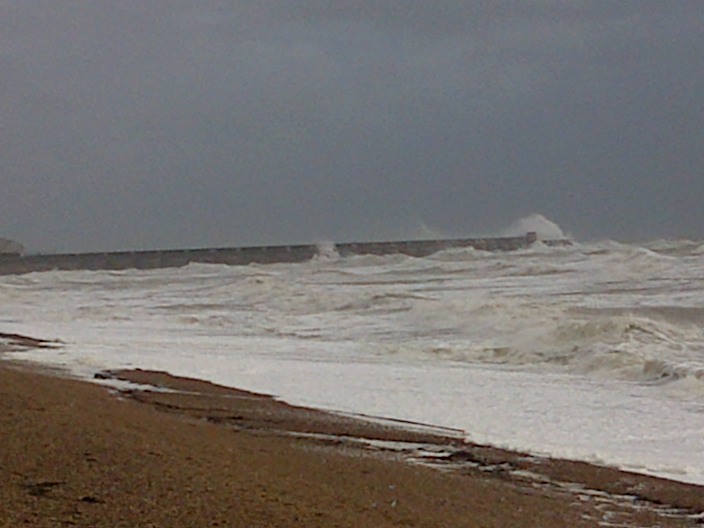 The adjacent sea area, Dover, to the East is just as bad. 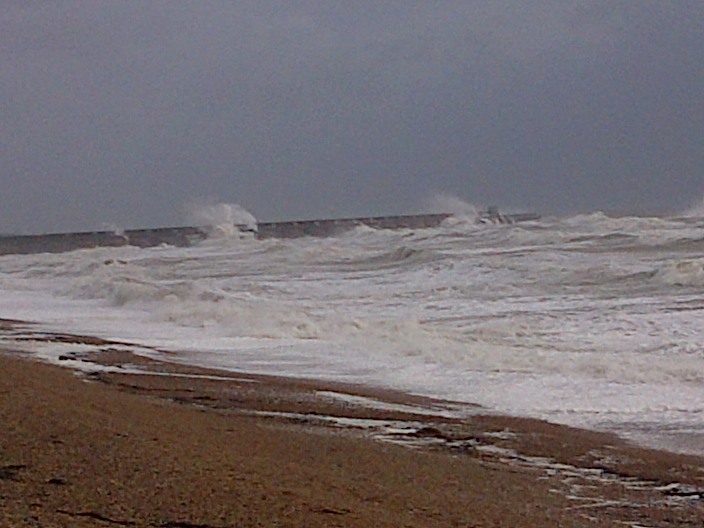 Evidently it’s not a good day to be messing about in boats. 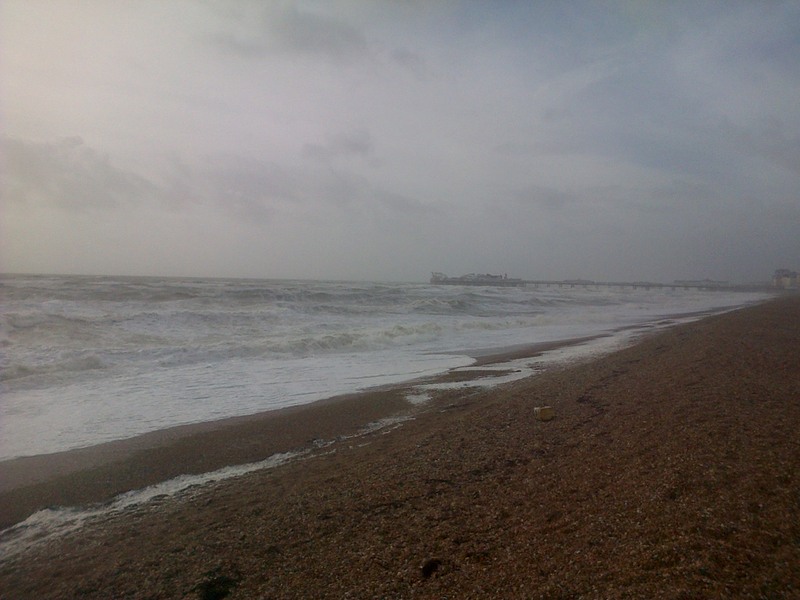 This lunchtime I took a walk along the beach at Brighton to see how bad it was. The wind direction was from the southwest and I estimated it was about force 7, based on the fact that it nearly blew me over when I turned into it. Not quite a gale, but getting there. A violent storm force 11 is bad enough, but there is a chance of hurricane force 12. That could cause damage on the scale of 1987. I’m now looking very nervously at the scaffolding covering several buildings in my street.. Here are some pictures I took with my phone looking towards the Marina. These are just the preliminaries, though. The bulk of the storm is yet to hit us. Something tells me we’re in for a stormy night!